← Meet Santakinz In The Clubhouse! For those in Webkinz World that celebrate Hanukkah during the holiday season, there’s a new Ornate Menorah you can pick up at the WShop throughout the month of December. This year, Hanukkah runs from the evening of December 2nd to December 10th. Each night, one of the candles on the Menorah will light until all the branches are lit on the final night. 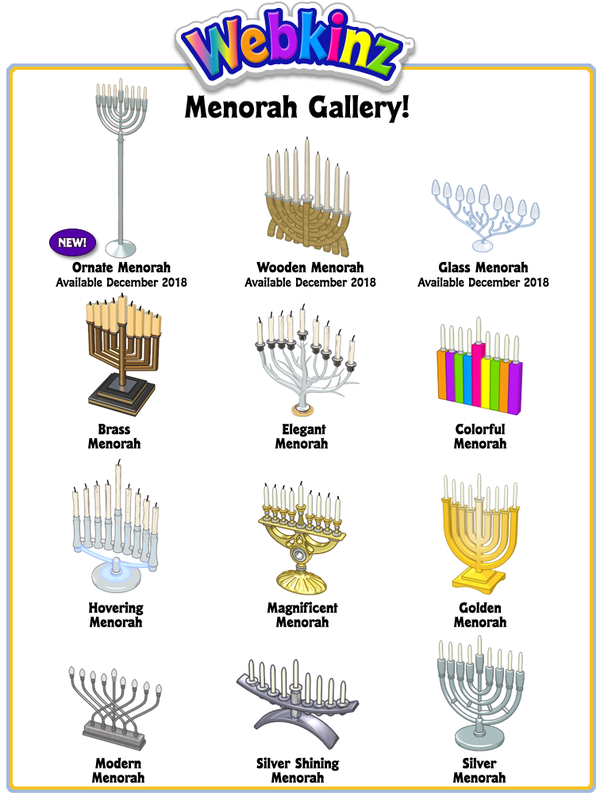 In addition to the new Ornate Menorah, you will also find the Glass Menorah and the Wooden Menorah returning to the WShop during this December. What traditions do YOU have over the holiday season? Let us know in the comments below. 62 Responses to Happy Hanukkah! If anyone has an extra colorful menorah, silver, silver shining, or golden one they don’t want I’d love to have it! I’m rosyposy707. What about adding a dreidel game? I love that you have the Menorah for the Jewish holiday, but Christmas isn’t about Santa for most Christians. It’s Jesus, it’s the nativity. I feel like Christmas gets the goofy Santa stuff while Hanukkah gets the special Menorah. Good point. I’d like to see a nativity scene, too. I’m not sure how WW would do that. It’s the same thing in the schools too. Every other faith and holiday significance is allowed to be taught except the Christian holidays. Hanukkah and Kwanzaa are allowed, but only Santa and Christmas trees for Christmas. And Passover is allowed, but only eggs and bunnies for Easter. Don’t worry, you are not the only one who has noticed and is frustrated. I would love for there to be equality for all cultural holidays, and I’m not sure why some things are off-limits. If WW would provide the clothing, we could dress our own pets as nativity characters, and stage a nativity, like we are doing a Christmas play. Old fashioned shepherd costumes would be wonderful! I think I could already figure out the rest of the scene with what I already own. That would be a great thing to send in to the room design features, if we could ever pull it off! I agree. I think the Menorahs are lovely, but it would be nice to have an Advent wreath beside them in the W-shop. They could call it a candle wreath. My family shares and enjoys the tradition of lighting the advent wreath candles every year. That would be an awesome addition to our WW holiday decor. I thought I read in the newz that there will be an advent calendar again this year. I will have to look back through the newz posts. If anyone has more info, please post it. I would hate to miss out on any days of prizes. Yes! Would really love an advent wreath! I agree!!! I think they should provide scenery and Old fashioned shepherd costumes! I hope someone sees this and makes it happen!! Thank You! This would be amazing! I would even spend estore points on it, although I know many could not. What a great idea! I vote yes to the Nativity! Guys, really??? I can’t believe you’re begrudging people their menorahs! You get a ton of Christmas this & that here every year. Try being satisfied with what you have! (It’s what Jesus would do). I am christian and I do not celebrate Hanukkah. But Happy Hanukkah people who celebrate! Well, in 2019, Christians and Jews will be celebrating together, December 23rd marks the first day of Hanukkah, next year. I love the menorahs and how they light up each day of the celebration. Such a wonderful inclusion. I like the idea of the W Shop selling a few seasonal foods like Hanukkah foods, Christmas cookies, Kwanzaa foods, Valentine cupcakes, etc. during the corresponding holiday month. I love this idea! Maybe they could have a food design contest and add in a new item each year!